Objective: To explore the temporal relation of demyelination and blood-brain barrier breakdown during new lesion formation. Background: Conventional MRI appears sensitive for detecting changes due to MS, but may be limited by poor pathologic specificity. By indirectly assessing protons bound to rigid macromolecules, magnetization transfer (MT) imaging may provide information relating to tissue structure and, by inference, myelin integrity. Methods: Gadolinium contrast-enhanced MRI and MT imaging were performed at weekly intervals for 3 months in three patients with MS. For each enhancing lesion, the largest corresponding area of proton density hyperintensity seen during the study was outlined and magnetization transfer ratio (MTR) calculated at each time point from coregistered calculated MTR images. Lesions greater than 20 mm2, not affected by partial volume effects, and first enhancing after the baseline study were analyzed. Two-dimensional registration software allowed accurate evaluation of MTR in regions both before and after the initial appearance of MS lesions. 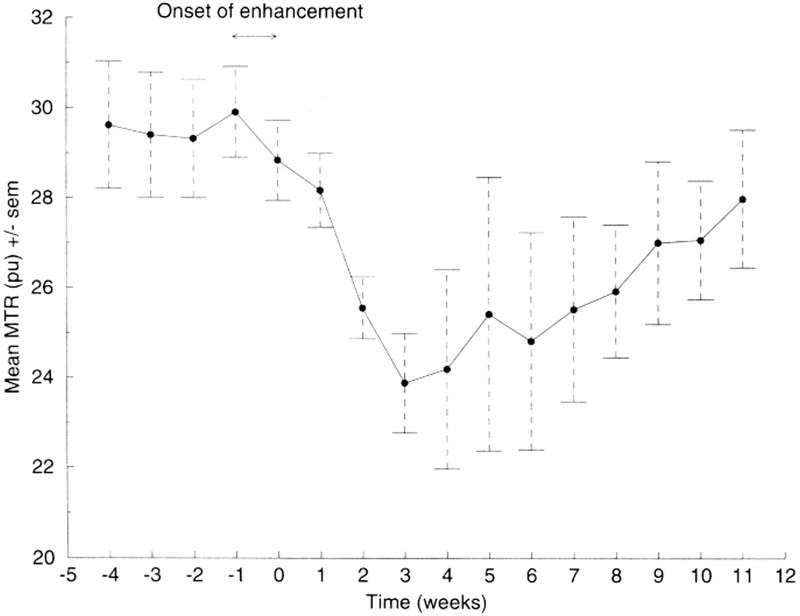 Results: Mean lesion MTR decreased significantly during the first week of enhancement (29.6 percent units [pu] immediately pre-enhancement versus 28.2 pu at first documented stage of enhancement). No significant MTR reduction was noted before this. Conclusion: The lack of observable change in MTR before the first detectable gadolinium enhancement within MS lesions suggests that blood-brain barrier disruption is closely related to, but not preceded by, demyelination. A crucial question concerning the pathogenesis of MS lesions is which comes first: BBB breakdown with inflammation and secondary demyelination or primary demyelination stimulating a secondary BBB leak with inflammation? We have performed weekly studies using gadolinium-enhanced T1-weighted MRI and MT imaging to investigate the sequence of events associated with the formation of a new MS lesion. All patients gave written, informed consent to participate in the study, which had been approved by the joint ethics committee of the Institute of Neurology and the National Hospital for Neurology and Neurosurgery. MRI protocol. All imaging was carried out with a 1.5 Tesla superconducting system with standard quadrature headcoil (Signa, GE Medical Systems, Milwaukee, WI). For all imaging, patients were repositioned in the scanner using techniques described elsewhere.25 A set of three T1-weighted pilot scans (sagittal, axial, and coronal) was initially performed to allow accurate repositioning for slice selection. At the initial MRI assessment, T1-weighted imaging was performed using a spin-echo sequence(repeat time [TR] = 500 ms, echo time [TE] = 14 ms, 16 contiguous 5-mm axial oblique slices, 2 number of excitations (Nex), field of view 24 cm, matrix 256 × 128). Proton density, T2-weighted, and calculated MTR images of the brain were obtained at each visit using a dual spin echo sequence (TR = 1500 ms, TE = 32/80 ms, 16 contiguous 5-mm axial oblique slices, 3/4 Nex, field of view 24 cm, matrix 256 × 128) performed both with and without presaturation pulses to saturate the broad resonance of immobile macromolecular protons. This was adapted from a previously described sequence.26 The applied presaturation pulse was a Hamming-apodized 3-lobe sinc pulse, with a duration of 64 ms and a peak amplitude of 14.6 µT (giving a nominal bandwidth of 62.5 Hz), applied 2 kHz off water resonance. The energy deposited by this pulse provided measurable differences between saturated and unsaturated images and ensured a good signal-to-noise ratio in the calculated MT image. To ensure exact coregistration of the pixels on saturated and nonsaturated images, scans with and without presaturation were interleaved for each TR period.26 This sequence not only allows accurate MTR calculation for each pixel, but also assures that calculated MTR, proton density and T2-weighted images are inherently coregistered. The patient was then removed from the imager and injected intravenously with a bolus dose of 0.1 mmol/kg Gd-DTPA before repositioning. The three pilot scans (sagittal, axial, and coronal) were repeated, followed by T1-weighted imaging using a spin echo sequence, the parameters of which were identical to those of the (noncontrast-enhanced) baseline study. Thirteen weekly studies were performed with the above protocol on each of the three patients who enhanced at the initial assessment. For each patient, the proton density images obtained at weekly intervals were coregistered using multislice registration software developed in-house.28 This applies a histogram-matched multiscale approach to Woods' Automated Image Registration routines29 to provide robust alignment of MRI data. Errors that can be caused by the relatively thick slices are reduced by the use of radiographic prepositioning. The registration parameters obtained from proton density images were automatically applied to the calculated MTR images obtained from the same imaging dataset, allowing the inherent coregistration between proton density and calculated MTR images to be maintained during such postprocessing. Serial postgadolinium T1-weighted images were also displayed on the Sun workstation and assessed by one observer (N.C.S.) to determine the time of initial enhancement and the duration of visible lesion activity. Lesions were designated as showing "definite enhancement" only if there was a corresponding lesion noted at some stage on the proton density and T2-weighted series. For each active lesion, a corresponding region of interest (ROI) was applied to include the maximum area of signal change seen on the full series of coregistered proton density images. For each lesion ROI, the mean MTR was measured for all serial images. By registering all serial data for each patient first, we were able to measure MTR in regions of "normal appearing" tissue before the first MRI appearances associated with new lesion formation. This also enabled more accurate ROI placement for subsequent MTR measurements during and in some cases after the period of enhancement. To determine the relation between BBB breakdown (indicated by gadolinium enhancement) and MTR, only those lesions that started to enhance after the baseline study were included in the analysis. Any lesions with an area smaller than 20 mm2 were excluded from the analysis, as were those adjacent to CSF spaces (to avoid potential measurement errors caused by slight misregistration or partial volume). Statistical analysis. Statistical analysis was carried out using a paired t-test to determine significant changes in lesion MTR related to gadolinium enhancement. Results. Clinical data. Patient 1 (aged 38 years) had relapsing-remitting MS. 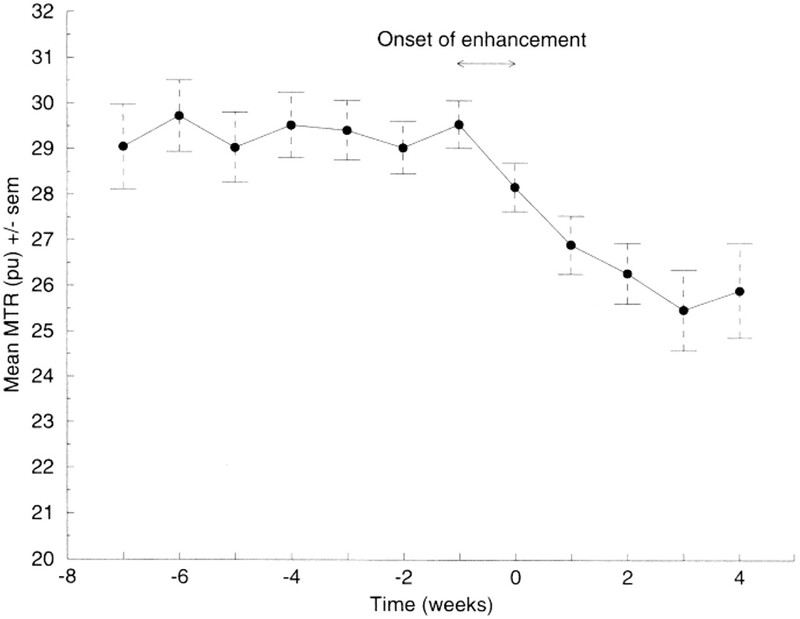 The EDSS score at study entrance was 6 and remained unchanged at exit despite a mild relapse in the fourth week. Patient 2 (aged 35 years) had secondary progressive MS. The initial EDSS score was 6, before worsening during the period of study to a score of 7. Patient 3 (aged 40 years) had secondary progressive MS. She remained clinically stable throughout the study and her EDSS was 7 at entrance and exit. MRI data. Overall, in the three patients, 48 lesions enhanced during the period of study. Ten of these lesions were noted to be enhancing at study onset and were excluded from further analysis. All of the remaining lesions were associated with corresponding high signal on proton density and T2-weighted images at or after initial enhancement and none had pre-existing high signal. Twelve of the remaining 38 lesions had an area smaller than 20 mm2 and three lesions were contaminated by partial volume with CSF; these were also excluded. The mean area of the remaining 23 lesions that were included for analysis was 40.6 mm2. For these 23 lesions, mean MTR decreased significantly during the week in which enhancement was first noted (29.6 pu pre-enhancement versus 28.2 pu at initial enhancement, 23 lesions, p < 0.001, paired t-test) (figure 1). However, no significant change in MTR was noted over the week preceding this (29.0 pu 2 weeks before initial enhancement versus 29.4 pu 1 week before initial enhancement, 23 lesions, paired t-test). Following initial enhancement, there was a steady and significant decline in mean lesion MTR for a further 3 weeks(28.1 pu to 25.5 pu, 19 lesions, p < 0.001, paired t-test). Figure 1. Change in lesion MTR relative to initial enhancement. Mean lesion MTR (pu) is shown for all lesions greater than 20 mm2. Time is shown in weeks, week 0 representing the time of initial documented enhancement. To determine the nature of MTR change within the acute lesion, we analyzed a single large lesion (101 mm2) that first enhanced at week 2 and continued to enhance throughout the study (figure 2). The initial appearance on T1-weighted images was of a small homogenous enhancing region seen for 2 weeks. On later studies, this enlarged with ring enhancement of the advancing edge; this was first seen at 3 weeks following initial enhancement and was associated with concurrent cessation of enhancement in the older center. Two ROIs were identified: a ring related to the corresponding area of ring enhancement on T1-weighted images and a central ROI corresponding to the initial central area of enhancement. A small decrease in MTR was first seen in the center of the lesion alone during the first week following initial enhancement (31.0 pu to 30.29 pu)(figure 3). The most notable decreases in MTR were seen in the center of the lesion and between 1 and 3 weeks following initial enhancement (to 21.6 pu in the second and 12.9 pu in the third week). Following this, a continued slower decline in MTR was observed in the lesion center despite the cessation of enhancement in this region, reaching a minimum of 7.4 pu (equivalent to 24% of the pre-enhancement value) 5 weeks after initial enhancement. The rim of the lesion showed no obvious decrease in MTR until 2 weeks after the initial appearance of central homogenous enhancement. This initial decrease in lesion rim MTR occurred later than in the center of the lesion. A further decrease in MTR was seen in the rim, albeit at a slower rate than the lesion center, reaching a minimum of 15.1 pu(equivalent to 48% of the pre-enhancement value) 5 weeks after initial enhancement. From the sixth week following initial enhancement until the final study, there was a gradual recovery in MTR both centrally and in the rim, reaching values of 19.9 pu and 26.0 pu, respectively (equivalent to 63% and 82% recovery). 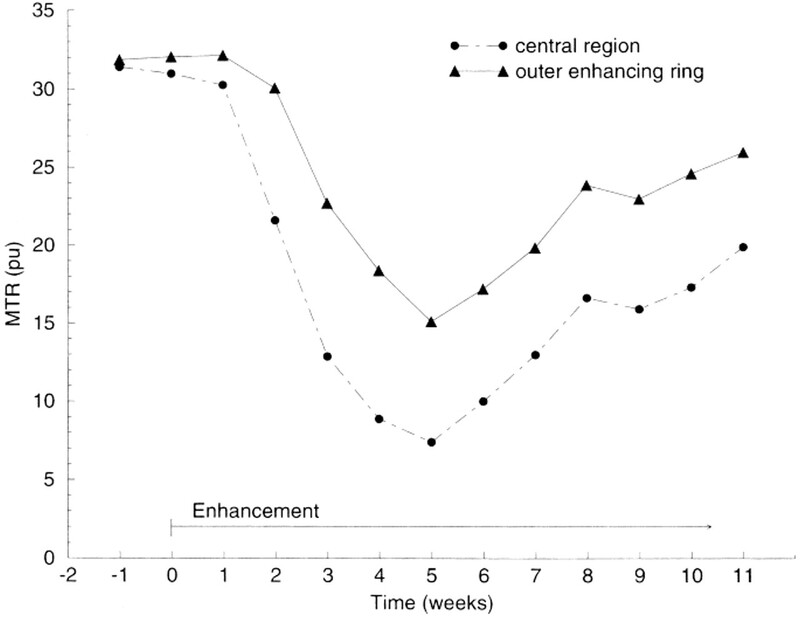 In general, we observed that larger lesions and those showing evidence of ring enhancement tended to be associated with greater decreases in MTR; in these cases in particular, this was often followed by a considerable gradual recovery (figure 4). Figure 2. Images show the initial appearances of a large new enhancing lesion: (A) Postgadolinium T1-weighted image shows a new lesion with focal enhancement; (B) Postgadolinium T1-weighted image 2 weeks later shows the new appearance of ring enhancement; (C) T2-weighted image corresponds to onset of ring-enhancing appearance; (D) Calculated MTR image corresponds to onset of ring-enhancing appearance. Figure 3. Change in MTR in the central region and peripheral during the initiation and evolution of a large ring-enhancing lesion. Figure 4. Mean lesion magnetization transfer ratio (MTR) (pu) for all lesions greater than 45 mm2 (mean = 71.6 mm2), showing a greater decrease in MTR and more significant resolution than seen with smaller lesions. Discussion. In this study, we have assessed the relation between BBB disruption and putative MRI markers of demyelination during the formation and early evolution of new MS lesions. Whereas previous studies have correlated MRI with pathologic changes apparent at biopsy or postmortem,16,30 assessed differences in MTR between enhancing and nonenhancing lesions,31-33 or evaluated change in MTR following enhancement,34,35 the authors are not aware of previous studies that have assessed MTR in an area of normal-appearing white matter as it evolves into a new MS lesion. In the three patients we studied, there was no instance of a detectable decrease in MTR before gadolinium enhancement. Following the first recognition of enhancement, there was a gradual decrease in MTR for most lesions over a period of a few weeks. Not infrequently, this was followed by a significant recovery, although prolonged follow-up (beyond 3 months) was not performed. We have also shown that a considerable recovery in MTR can occur despite continuing evidence of BBB breakdown, as evidenced by persisting enhancement. The mechanisms and significance of these findings are now discussed. The primary event in the formation of a new MS lesion. It is clear from MRI studies that vascular events are prominent in the early evolution of MS lesions.36 Such studies have not resolved whether these events represent a primary and obligatory event for the initiation of an acute lesion or an epiphenomenon related to perivascular myelin breakdown initiated by some independent process.37 In the peripheral nervous system, Wallerian degeneration may be associated with an increase in blood-nerve barrier permeability, suggesting that vascular events may occur secondary to either axonal or myelin breakdown.38,39 However, we are not aware of comparable data for the CNS, and in cases of lysolecithin- or cuprizone-induced experimental demyelination, there is no related inflammation or BBB deficit.5,40 Retinal studies in acute optic neuritis associated with MS provide evidence that inflammatory lesions with blood-retinal barrier breakdown can occur in unmyelinated regions.41 Although the retina and brain share many similarities in their normal vascular structure and function and undergo similar pathophysiologic changes in MS, these studies suggest but cannot establish that new focal brain lesions are initiated by vascular events. In the current study, we have shown no observable change in MTR before the first detectable gadolinium enhancement within MS lesions; the lack of change in MTR suggests there is no significant demyelination developing in the weeks before BBB breakdown. We also selected 15 regions of white matter that appeared "normal" on the baseline study and which subsequently evolved into lesions, and compared the mean MTR from these areas with that of 15 equivalent contralateral regions of"normal-appearing" white matter that remained unaffected throughout the study period. No significant differences were seen between regions that either did or did not evolve into lesions (30.3 pu versus 29.9 pu; p> 0.05, Wilcoxon matched pairs signed rank sum test). Thus, although it remains possible that a minor degree of demyelination is diffusely present in areas of "normal-appearing" tissue, it is unlikely that this specifically predisposes to subsequent focal breakdown of the BBB. The results do not preclude a mild degree of myelin disruption or damage, beyond the detectability of MTR measurement, as an early event preceding BBB breakdown. The report of apparent lipid peaks observed with proton magnetic resonance spectroscopy before the appearance of gadolinium-enhancing lesions could indicate such a process.42 However, our observation suggests that a major degree of demyelination occurs only after disruption of the BBB. We have observed a steady decrease in MTR in the majority of lesions following initial gadolinium enhancement for approximately 1 month. We have observed greater decreases in MTR in larger lesions or those with ring enhancement. One such lesion, which showed initial focal central enhancement at onset followed by the appearance of ring enhancement 2 weeks later that persisted for a further 10 weeks, provides insight into the pathologic sequence of events. An initial decrease in MTR was seen only in the center of the lesion, corresponding to the region where enhancement was first seen on gadolinium-enhanced images. During the first week following the initial appearance of enhancement, only a mild reduction in MTR was seen (< 4% of the initial value). This corresponds to the mild reductions reported in lesions where edema occurs in the absence of demyelination or axonal loss.9,45 Such changes support the hypothesis that the initial events in the formation of an acute lesion are inflammatory changes associated with opening of the BBB. A more significant decrease in MTR was observed in the center of the lesion over the following 4 weeks (76% reduction compared with pre-enhancement values). This reduction suggests a significant loss of structure within the lesion, more than could be accounted for by edema alone. These findings are in agreement with pathologic studies showing significant central demyelination within acute lesions. Although it is also possible that a loss of axonal integrity is contributing to this MTR reduction, studies of diffuse axonal injury caused by traumatic brain injury have shown only mild reductions in MTR.12,13 It is therefore likely that, following an initial central inflammatory response to BBB breakdown, demyelination occurs and these processes spread radially, as evidenced by the later but still substantial reductions in the rim of the lesion (52% reduction compared with pre-enhancement values). The rim may not reach such low MTR values as the center for various possible reasons; 1) demyelination is less pronounced, perhaps because oligodendrocytes tend to be more preserved at the edge of the acute lesion; 2) edema may be less marked away from the central area of the lesion; 3) remyelination is more prominent than at the center of the lesion46; 4) macrophages containing myelin debris tend to accumulate at the lesion edge and these, being structural elements, might be expected to maintain MTR values to a certain degree; or 5) it is possible that the method of analysis is affected to some extent by partial volume effects with normal surrounding tissue. The resolving lesion. It is not possible to comment on the long-term evolution in the whole group of lesions, as only a small number had prolonged assessment up to 12 weeks following initial enhancement and there may be remodeling or repair for a longer period. However, some lesions did show a prominent gradual recovery in MTR, although not usually to pre-enhancement values. The findings of the current study are in agreement with longer term follow-up MT imaging studies, where it has been suggested that various factors including remyelination, resolution of edema, and gliosis may all to some degree be responsible for the significant but incomplete resolution of MTR values seen in large MS lesions.34,35 However, the relative contributions of these processes to the recovery in MTR remains uncertain. Our data suggest that extensive demyelination (which should be detectable by MTR measurement) is an unlikely primary event in the initiation of an acute, focal inflammatory lesion, and only appears to occur subsequent to changes associated with breakdown of the BBB. We are grateful to those patients who allowed us to perform this study. The NMR Research Unit is supported by a generous grant from the Multiple Sclerosis Society of Great Britain and Northern Ireland. Received December 10, 1997. Accepted in final form June 6, 1998. Dawson JW. The history of disseminated sclerosis. Trans R Soc Edinburgh 1916;50:517-740. Prineas JW, McDonald WI. Demyelinating diseases. In: Graham DI, Lantos PL, eds. Greenfield's neuropathology. London: Arnold, 1997:815-868. Young IR, Hall AS, Pallis CA, Legg NJ, Bydder GM, Steiner RE. Nuclear magnetic resonance imaging of the brain in multiple sclerosis. Lancet 1981;2:1063-1066. Miller DH. Magnetic resonance in monitoring the treatment of multiple sclerosis. Ann Neurol 1994;36:S91-S94. Dousset V, Brochet B, Vital A, et al. Lysolecithin-induced demyelination in primates: preliminary in vivo study with MR and magnetization transfer. Am J Neuroradiol 1995;16:225-231. Dousset V, Brochet B, Vital F, Nagem J, Bonnet, Caillé JM. MR imaging including diffusion and magnetization transfer of chronic relapsing experimental encephalomyelitis-correlation with immunological and pathological datas. Proc Soc Magn Reson 1994;1401. Abstract. Dousset V, Armand JP, Degreze P, Mieze S, Lafon P, Caillé JM. Progressive multifocal leucoencephalopathy studied by magnetization transfer imaging. Proc Soc Magn Reson Eur Soc Magn Reson Med Biol 1995;284. Abstract. Silver NC, Barker GJ, MacManus DG, Miller DH, Thorpe JW, Howard RS. Decreased magnetisation transfer ratio due to demyelination: a case of central pontine myelinolysis. J Neurol Neurosurg Psychiatry 1996;61:208-209. Dousset V, Grossman RI, Ramer KN, et al. Experimental allergic encephalomyelitis and multiple sclerosis: lesion characterisation with magnetization transfer imaging. Radiology 1992;182:483-491. Thorpe JW, Barker GJ, MacManus DG, et al. Magnetization transfer ratio and transverse magnetization decay analysis of the optic nerves in optic neuritis. Proc Soc Magn Reson 1994;883. Abstract. Lexa FJ, Grossman RI, Rosenquist AC. MR of Wallerian degeneration in the feline visual system: characterization by magnetization transfer rate with histopathologic correlation. AJNR Am J Neuroradiol 1994;15:201-212. Kimura H, Meaney DF, McGowan JC, et al. Magnetization transfer imaging of diffuse axonal injury following experimental brain injury in the pig: characterization by magnetization transfer ratio with histopathologic correlation. J Comput Assist Tomogr 1996;20:540-546. Hanover DA, Kimura H, Yang JH, Grossman RI, Smith DH, McGowan JC. Sensitivity of magnetization transfer imaging to diffuse axonal injury at multiple time points. Proc ISMRM 1997:624. Abstract. Hawkins CP, Munro PMG, Mackenzie F, et al. Duration and selectivity of blood-brain barrier breakdown in chronic relapsing experimental allergic encephalomyelitis studied by gadolinium-DTPA and protein markers. Brain 1990;113:365-378. Kermode AG, Thompson AJ, Tofts P, et al. Breakdown of the blood-brain barrier precedes symptoms and other MRI signs of new lesions in multiple sclerosis. Brain 1990;113:1477-1489. Katz D, Taubenberger JK, Cannella B, McFarlin D, Raine CS, McFarland HF. Correlation between magnetic resonance imaging findings and lesion development in chronic, active multiple sclerosis. Ann Neurol 1993;34:661-669. Thompson AJ, Kermode AG, Wicks D, et al. Major differences in the dynamics of primary and secondary progressive multiple sclerosis. Ann Neurol 1991;29:53-62. Thompson AJ, Miller DH, Youl B, et al. Serial gadolinium-enhanced MRI in relapsing-remitting multiple sclerosis of varying disease duration. Neurology 1992;42:60-63. Gonzalez-Scarano F, Grossman RI, Galetta S, Atlas SW, Silberberg DH. Multiple sclerosis disease activity correlates with gadolinium-enhanced magnetic resonance imaging. Ann Neurol 1987;21:300-306. Smith ME, Stone LA, Albert PS, et al. Clinical worsening in multiple sclerosis is associated with increased frequency and area of gadopentate dimeglumine-enhancing magnetic resonance imaging lesions. Ann Neurol 1993;33:480-489. Frank JA, Stone LA, Smith ME, Albert PS, Maloni H, McFarland HF. Serial contrast-enhanced magnetic resonance imaging in patients with early relapsing-remitting multiple sclerosis: implications for treatment trials. Ann Neurol 1994;36:S86-S90. Poser CM, Paty D, Scheinberg L, et al. New diagnostic criteria for multiple sclerosis: guidelines for research protocols. Ann Neurol 1983;13:227-231. Kurtzke JF. Rating neurological impairment in multiple sclerosis: an expanded disability status scale (EDSS). Neurology 1983;33:1444-1452. Lai M, Hodgson T, Gawne-Cain M, et al. A preliminary study into the sensitivity of disease activity detection by serial weekly magnetic resonance imaging in multiple sclerosis. J Neurol Neurosurg Psychiatry 1996;60:339-341. Gallagher HL, MacManus DG, Webb SL, Miller DH. A reproducible repositioning method for serial magnetic resonance imaging studies of the brain in treatment trials for multiple sclerosis. J Magn Reson Imaging 1997;7:439-441. Barker GJ, Tofts PS, Gass A. An interleaved sequence for accurate and reproducible clinical measurement of magnetization transfer ratio. Magn Reson Imaging 1996;14:403-411. Plummer DL. DispImage: a display and analysis tool for medical images. Revista Di Neuroloradiologica 1992;5:489-495. Symms MR, Barker GJ, Wang L, Tofts PS. Improving spatial registration of multislice two dimensional MR images with a radiographical repositioning technique. Proc Int Soc Magn Reson Med 1997:689. Abstract. Woods RP, Cherry SR, Mazziotta JC. Rapid automated algorithm for aligning and reslicing PET images. J Comput Assist Tomogr 1992;16:620-633. Nesbit GM, Forbes GS, Scheithauer BW, Okazaki H, Rodriguez M. Multiple sclerosis: histopathologic and MR and/or CT correlation in 37 cases at biopsy and three cases at autopsy. Radiology 1991;180:467-474. Hiehle JF, Grossman RI, Ramer KN, Gonzalez-Scarano F, Cohen JA. Magnetization transfer effects in MR-detected multiple sclerosis lesions: comparison with gadolinium-enhanced spin-echo images and nonenhanced T1-weighted images. AJNR Am J Neuroradiol 1995;16:69-77. Campi A, Filippi M, Comi G, Scotti G, Gerevini S, Dousset V. Magnetization transfer ratios of contrast-enhancing and non-enhancing lesions in multiple sclerosis. Neuroradiology 1996;38:115-119. Petrella JR, Grossman RI, McGowan JC, Campbell G, Cohen JA. Multiple sclerosis lesions: relationship between MR enhancement pattern and magnetization transfer effect. AJNR Am J Neuroradiol 1996;17:1041-1049. Lai HM, Davie CA, Gass A, et al. Serial magnetization transfer ratios in gadolinium-enhancing lesions in multiple sclerosis. J Neurol 1997;244:308-311. Alonso J, Rovira A, Gucurella MG, et al. Serial magnetization transfer imaging in multiple sclerosis lesions. Proc ISMRM 1997:639. Abstract. McDonald WI, Miller DH, Barnes D. The pathological evolution of multiple sclerosis. Neuropathol Appl Neurobiol 1992;18:319-334. Calder V, Owen S, Watson C, Feldmann M, Davison A. MS: a localized immune disease of the central nervous system. Immunol Today 1989;10:99-103. Seitz RJ, Reiners K, Himmelmann F, Heininger K, Hartung HP, Toyka KV. The blood-nerve barrier in Wallerian degeneration: a sequential long-term study. Muscle Nerve 1989;12:627-635. Latker CH, Wadhwani KC, Balbo A, Rapoport SI. Blood-nerve barrier in the frog during Wallerian degeneration: are axons necessary for maintenance of barrier function? J Comp Neurol 1991;308:650-664. Bakker DA, Ludwin SK. Blood-brain barrier permeability during Cuprizone-induced demyelination. Implications for pathogenesis of immune-mediated demyelinating diseases. J Neurol Sci 1987;78:125-137. Lightman S, McDonald WI, Bird AC, et al. Retinal venous sheathing in optic neuritis. Its significance for the pathogenesis of multiple sclerosis. Brain 1987;110:405-414. Narayana PA, Doyle TJ, Lai D, Wolinsky JS. Serial proton magnetic resonance spectroscopic imaging, contrast-enhanced magnetic imaging, and quantitative lesion volumetry in multiple sclerosis. Ann Neurol 1998;43:56-71. Lassmann H, Suchanek G, Ozawa K. Histopathology and the blood-cerebrospinal fluid barrier in multiple sclerosis. Ann Neurol 1994;36:S42-S46. Barnes D, Munro PMG, Youl BD, Prineas JW, McDonald WI. The longstanding MS lesion. A quantitative MRI and electron microscopic study. Brain 1991;114:1271-1280. Mehta RC, Pike GB, Enzmann DR. Measure of magnetization transfer in multiple sclerosis demyelinating plaques, white matter ischemic lesions, and edema. AJNR Am J Neuroradiol 1996;17:1051-1055. Prineas JW, Connell F. Remyelination in multiple sclerosis. Ann Neurol 1979;5:22-31.